I am your typical snuggle with a blanket, drink hot coco, and read a good book before bed type of girl. I have been a bookworm for as long as I can remember and I really hope you don't mind how much I will post about books. Books have always been an escape from reality for me. There have been so many weekend nights where I am just not up for crowds and loud nights so instead I will turn on my Christmas lights, lay on my bed and read for hours. To me, reading really is a huge stress reliever and a nice break from reality. I have read everything from nursery rhymes to scholastic to AP English assigned books. I seriously have no judgment when it comes to books and that is why I decided to share with you my all time favorites. Okay so of course I had to start with my favorite book in the whole world. I have read this book a dozen times and I'm not even exaggerating about that. I had to buy a second copy because my first one fell apart. If this book doesn't tug at your heart then either you don't have one or you honestly didn't understand it. 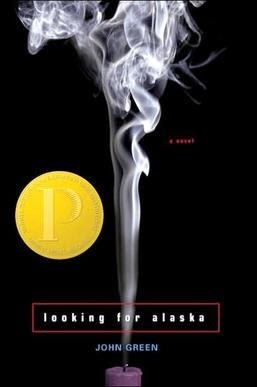 This book was recently made into a movie, which besides that I wanted it to be longer (I mean I literally wanted every page to be in there), there was nothing to complain about. The biggest reason for this was because the author of the book was the director of the movie. He completely treated this project like his baby and made sure that it was perfect. I highly respect him for doing so because everything from the cast to the script was amazing. This is my favorite book (and one of my favorite movies now) and I would recommend this book to you over and again! Sundays at Tiffany's was a book that I read back in high school. I honestly just bought it because it said Tiffany's. . . but OH MAN! This book completely blew my mind. I didn't know what to expect, but I definitely didn't expect the main characters to fall in love and on top of that one of the main characters is the other one's imaginary friend! Like what? You're confused and I understand, I was where you are now until about chapter four. As confusing as this story line sounds, I promise that once you get the hang of it this book will surprise you and make you wish that you had an imaginary friend when you were younger. I highly recommend this book and not just because the word Tiffany's is on it. Anyone who is my age is probably looking at this book title with the strangest face right now. Really she likes this book? I promise it is not as bad as it looks. I had to read this book for AP English back in high school and after reading novel after novel, I was sort of over the whole English Medieval Century themed novels, but this story line was a confusing web of relationships. Person A loved person C who loved person B who loved person D who loved person A until A messed up and then there was a bunch of drama in between. Not just typical teenage drama, no, like serious weird issues that just tied this book together perfectly. If you can get through the very detailed descriptions of the scenery and focus on the character development, I promise that this book will have you hooked. Even if you don't have to read if for school, I highly recommend that you read this book and if you do have to read it for school- at least spark notes it. 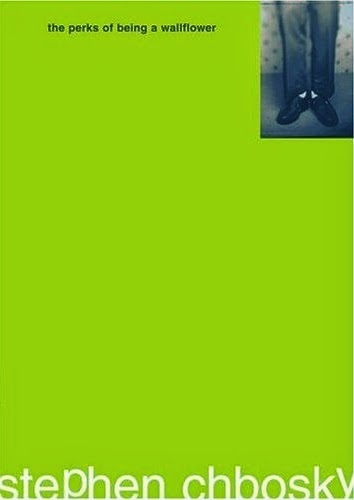 I really don't even know what to write about this book because it has to be one of the most amazing books of all time. Honestly, if you haven't read this book you just aren't living life right. If you haven't read the book but you LOVED the movie… then you need to just stop. Everyone needs to read this book. I'm not just recommending this to you- I am telling you that you must read this book. 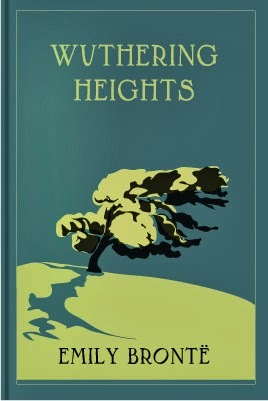 This book is such a classic and not only is it a classic book it's a classy storyline, with classy characters, and a classy setting. When the characters are rich you feel rich. When the characters are sad you feel sad. This book will have complete control over your emotions. Especially at the end where you will throw the book at my face because you'll be mad that I recommend this to you. THAT IS HOW AMAZING THIS BOOK IS! Go ahead read it, Old Sport. This is the first series of books that I completely fell in love with. Each book just got better and better. I actually read all three books in the span of a four day weekend- yeah, that's how hooked I was. Now if you haven't seen the movie then let me give you a little background. The main character has grown up in a messed up society, life is not like it is now a days. The president has children compete in something called The Hunger Games, where they have to kill each other and the last person standing wins. Messed up, right? Right, well the whole series is about the main character fighting back and standing up for her loved ones. Yes the main character is a girl, yes there is a love triangle in the series, but no that is not what the series is about. Out of all the books you will read more about blood and fights then you do about kissing. Which is exactly why I recommend this trilogy to you. I promise you won't regret it. This book came into my life when I was actually having a difficult time of keeping up with school work, applying to college, working nights after soccer practice, and trying to make my parents proud. When I started to read this book I could not put it down. I completely lost myself in it- to the point where I was obsessed over finishing it. I was reading it at school, work, before bed- really whenever I had a chance to. After reading this book, and after crying my eyes out, I was suddenly more motivated to do better in life. I mean, don't get me wrong I wasn't like a bad kid doing drugs or failing, I was just struggling. This novel came into my life at the perfect time though and helped me. The writing of this novel made me want to not end up like the end of this book- I wanted better. If anyone is going through a situation like I was I do highly recommend this book. Even if you're at a good place in your life I still recommend that you read this book and I promise it will make you more grateful for the amazing life that you have. I might seem like a little kid when I talk about these books, but I promise… I'm 21 and these two books are still some of my favorites. 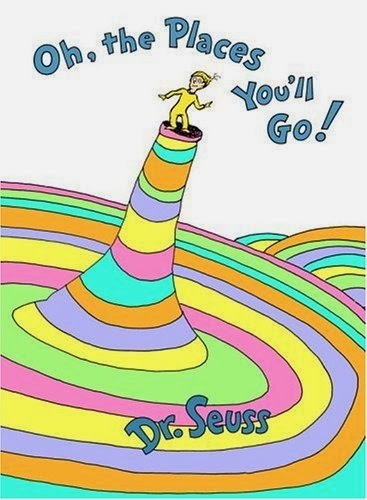 I have read every Dr. Seuss book and everyday I am sad that there aren't more. Not only did I read these for pleasure as a child- I also did a report about him and his books my senior year of high school and I learned a lot. Especially about the true meanings behind some of his books (depressing!). These two always stuck with me though. 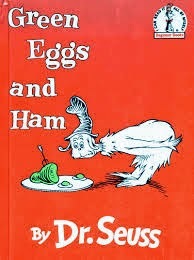 I think that Green Eggs and Ham stuck with me because I remember being young and playing a computer game that involved this book. Ever since then I have always been very fond of this one. Now, Oh, the Places You'll Go! has a much more deeper meaning to me. My Mother actually gave me this book as a graduating gift. I thought that this was the sweetest and most thoughtful gift ever. It probably sounds really cheesy, but I don't care. Given my love for reading and Dr. Seuss this book was completely appropriate. I took this book with me to college and whenever I was feeling homesick I would bust this book out and read it over and over again until I would fall asleep. This book always reminded me how proud my parents were of me and it always made me feel safe. It doesn't matter how old you are, if you can find a book that brings you back to your roots you stick with it. If we have any of the same favorites, let me know! I could talk about a story for hours, especially if it was turned into a movie (we can talk about all the things they did wrong!). If we don't have any of the same faves please, please, please recommend a book to me! I am constantly writing down titles that I need to pick up!